Do you use HDFC Credit Card? Do you remember the PIN or note down it somewhere? It is not safe to note down the PIN for security purposes. Do you know what to do when you forget the PIN? Yes! You can generate the PIN very easily without visiting the branch! You can also reset the PIN provided by the bank before making transactions for the first time. You need to set a PIN that you can easily remember. 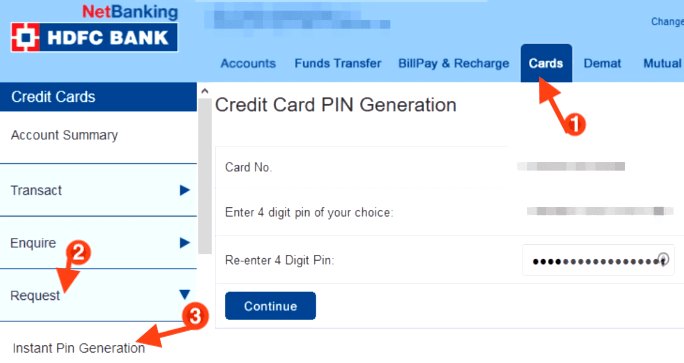 HDFC Bank offers varied ways to generate the credit card PIN. You need to follow the steps without any mistake. You can generate the PIN through ATM. First of all, call HDFC credit card customer care number to receive the OTP on your registered mobile number. The next step is to insert the credit card at an HDFC ATM. Select the language and select 'Create New ATM PIN using OTP' option. Enter the OTP on the screen received on your registered mobile number. Enter the registered mobile number without any mistake. Now, set a new set of 4-digits PIN that you can easily remember. Step 1: Generate the PIN for your credit card via Net Banking. You need to log in to your net banking account using the Customer ID and the IPIN. Choose the 'Cards' tab. Step 2: From sidebar below credit cards, select the request tab and click on 'Instant Pin Generation'. Step 3: Select the credit card number from the drop-down menu. Enter and re-enter the 4 digit Pin. 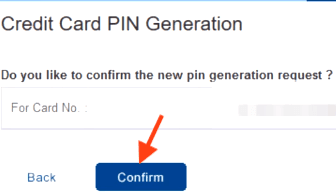 Step 4: Click on 'Confirm' button to proceed in the process of generating PIN. Step 5: Now select your registered mobile number to receive a one-time password and click the 'continue' button. Step 6: Now enter one-time password received to your registered mobile number to confirm credit card pin generation and click the 'continue' button. The screen will display the message about the successful completion of the request. You will receive the new Pin for your credit card on your mailing address as registered with the bank.